- and it's a loss. 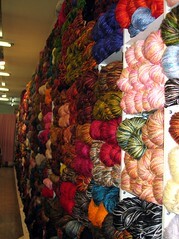 before i went to argentina, i did some googling on the web to try to figure out where to buy yarn in buenos aires. when trying to find actual yarn store sites wasn't turning up much, i decided to try to find a friendly porteño who knits. and man, did i get lucky! i found Vik who blogs at like-grandma.blogspot.com. Vik so far exceeded my imagination of how fun hanging out with a stranger from across the globe could be. we spent an awesome saturday morning having breakfast, yarn shopping, and lunching. she laughed at me when my jaw hung open at the sheer volume of yarn in some of these shops. seriously, they sell wool by the kilo there. i've posted some photos from the day on flickr. the first of the group starts here. the internet sure has made the world such a small place, hasn't it? pretty damn cool. i just got back from argentina, or more specifically buenos aires. before i went, i wasn't very fond of steak. but oh man, do i like it now. 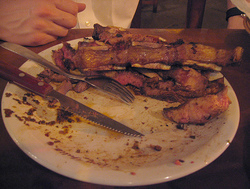 coincidentally, today someone at the site idlewords.com posted an amazing entry called argentina on two steaks a day that explains why argentine beef is so special. honestly, it makes me want to head back to argentina tomorrow. i didn't eat enough cow. i probably only ate about 5 steaks during my two-week visit. however, i'm proud to say that i did order some sweetbreads - a giant portion of sweetbreads with fries, onion rings, and watercress - and managed to finish about half of it. photos from our trip are here on flickr. and there are movies here.